Within the platform, you have access to several data in real time regarding your campaign. The stats are available in the Campaign details section. Number of unique passes generated by the platform. Each time a user visits the download page for the first time a unique pass will be issued him if the that user returns to download page in the next 24 hours the platform will deliver the same pass instead of issuing him a new one. Number of times a pass is added into a mobile wallet (Apple Wallet, Android Pay or other third-party app). 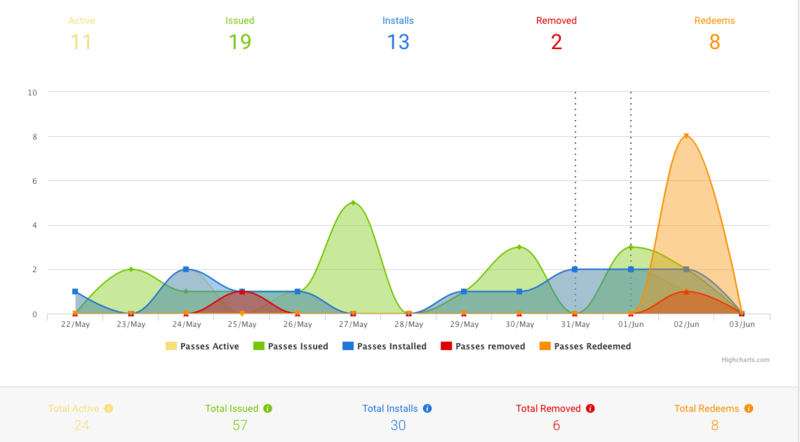 Number of passes deleted or disabled by the users. Number of passes that were redeemed in store or at the event. Number of passes still installed inside a users mobile wallet. (It’s the number of installed passes minus passes deleted or disabled). The numbers above the graphic correspond to the time frame period that you’re currently viewing on the graphic. As for the numbers below the graphic, it corresponds to the total number of users, since the campaign was published. Next to the calendar icon, you have the possibility to export the data into a CSV file.